HomeOn The SquareBone Shaker Brings it! When it comes to the Bone Shaker bicycle, historians agree it has a well-earned reputation. Invented in the 1860s by French company Michaux at the time of the first bicycle craze, it was the first true bicycle with pedals. The term Bone Shaker refers to the extremely uncomfortable ride, which was caused by the stiff wrought iron frame and wooden wheels surrounded by tires made of iron. Ouch! On Saturday, October 8, Pook & Pook offers bidders the chance to test drive a Bone Shaker of their own when they stage Day 2 of their Americana sale. Selling as Lot 312, this rare gem, built in 1870 by New York’s Wood Brothers, is one of the few fully restored Bone Shakers remaining in existence. The Bone Shaker’s popularity was short lived. 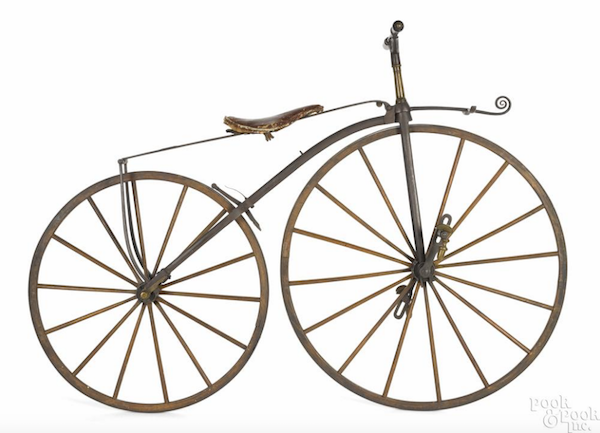 It fell out of favor after the summer of 1869, and was replaced in 1870 with the type of bicycle called Ordinary, High-Wheel, or as it’s better known, the Penny-Farthing. Few original Bones Shakers exist today, most having been melted for scrap metal during World War I. The Wood Brothers Bone Shaker wont be the only prized 19th Century lot to go under the hammer on October 8. 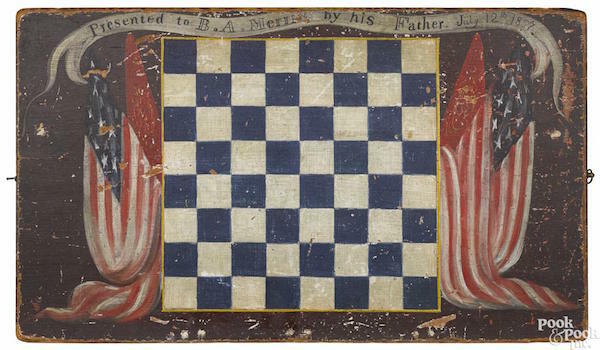 This painted pine sailors gameboard, heralding from New England, is sure to draw its share of attention. 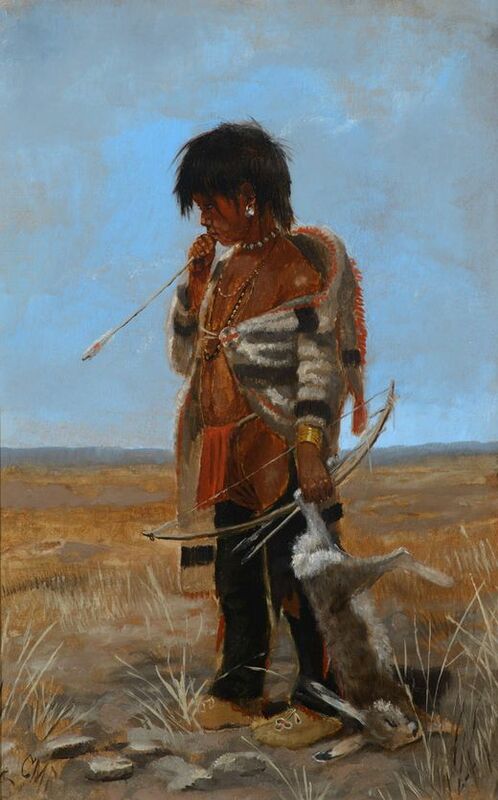 Selling as Lot 505, it is inscribed "Presented to B. A. Merrill by his Father July 12th 1857." The catalog for the Americana sale is always filled with quality early-American furniture, and this years renewal more than holds its own. 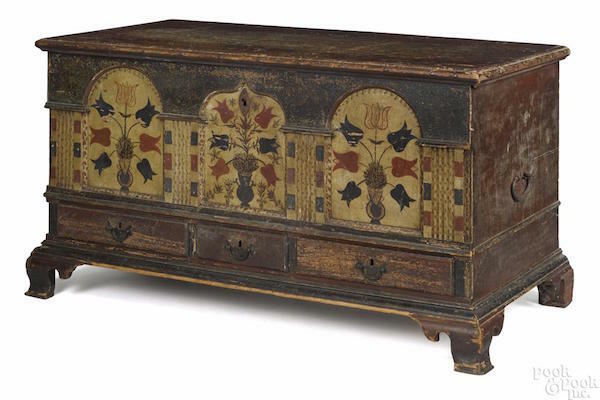 Lot 484, a painted poplar architectural dower chest from Lancaster County, Pennsylvania, dates back to 1795 and is expected by many to be this years sale topper. You can never have enough good tables, and Lot 532, an extremely rare Berks County, Pennsylvania painted walnut stretcher base tavern table, will look great in a multitude of settings. 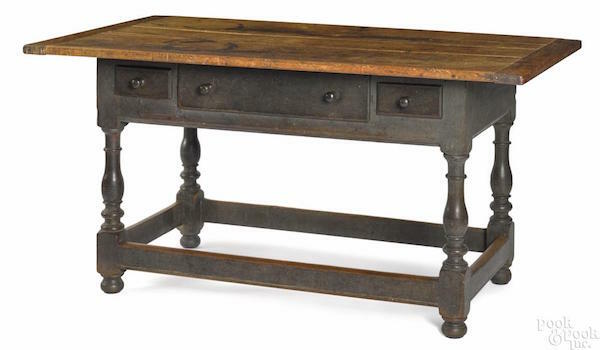 Dating from 1760, the table is unusual in that it retains an excellent old blue painted surface. Pook & Pooks Americana sale is set down for Friday, October 7 and Saturday, October 8 and contains nearly 850 expertly curated lots. Looks now at the full catalogs.